Megan Marshman is such an amazing woman and role model and yes, that really is the full title of her breakout. She has devoted her life to loving God and empowering others to do the same. She has served in almost every ministry in the church and is currently the director of women’s ministries at Hume Lake Christian Camps and associate dean of Youthmin Academy. She is such a down to earth person who doesn’t put on a facade for her ministry. 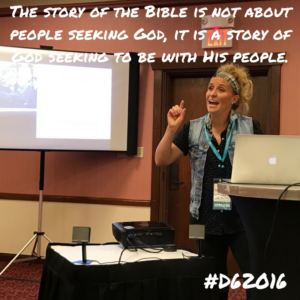 The truths she shared with us really made me think about how I view God and people. If you ever get a chance to hear her speak, you will not be disappointed. I didn’t get everything she talked about written down, but Megan unpacked how we can see that God wants to be WITH His people throughout the entire Biblical narrative. We see that God is the Creator. Even though the world and people may change, God doesn’t. God brings light out of the darkness. Sometimes when our darkness gets exposed it can be uncomfortable. Creation was not an act of filling some sort of emptiness or need. He created out of abundance to share what He had with us. God says it is good over and over, then breaks the repetition to say “you are very good” about man. God breaks the repetition to say you are different, humanity. Always take note when there is repetition in the Bible. 4 responses of Adam and Eve to sin: They were ashamed, they blamed each other, they had fear and anxiety, and they hid. We still react the same way when we sin against God. God is a perfect God who wants to dwell with imperfect people. God has the people build a temple so He can be WITH His people. Every world religion has a metaphorical ladder where people are trying to make their way to God. The distinction with Christianity is there is still a ladder, but because God knew we couldn’t get to Him, Jesus came down the ladder to us. God wanted to be WITH His people so much that He came down to be one of them. The better option is life WITH God and WITH people. Megan says that she believes that next step of leadership is listening. Listening is not waiting for your turn to talk. She had all of us find a partner and choose who was going to be “Person A” and who would be “Person B”. Once we had chosen, she said that Person A would have to tell their life story in three minutes with eye contact while Person B could only listen. When the three minutes was up, she gave Person B one and a half minutes to tell Person A back their life story as close to the original as possible. This was a great exercise that illustrated how we often don’t actively listen or make good eye contact when we are talking to people. God wants to be with us more than we (often times) want to be with Him. We need to learn how to love people and desire to be with them like God does. One way we can show people we care about them is by truly listening to them and looking them in the eye. Most people aren’t used to someone really listening to them. When do I make time for the kids in my ministry to spend time with Jesus? What are you doing in your services to foster quality time WITH God and WITH people?